This post is going to be a review on the Freshel Whitening Gel. I have been using this since the first week of January 2014 and I feel that I have used it long enough to form my thoughts on it. 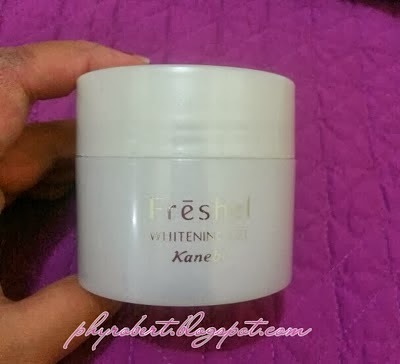 First of all, let's see what Freshel has to say about it..
Freshel Whitening Gel is actually a gel-based moisturiser that controls melanin production and prevents spots. Not only that, it has 5 functions (lotion, essence, emultion, cream and moisturising makeup base) under it's belt. 1. The thick consistency of the gel disintegrates as soon as it touches the skin, moisturising it without leaving a sticky feeling. 2. It contains fruit acid which softens the skin's keratine, enabling the product to absorb better into the skin. 3. The plant-derived ingredients creates a 'moisture veil' to keep moisture within the skin. Contains Vitamin C, Collagen, Hyaluronic Acid and Fruit Acid. This is a product after my own heart. Why? Because for one thing, I think that gel moisturisers are practically God-sent for those with oily skin such as myself. Second, a single product that does it all is right up my alley because I am a Lazy Bum when it comes to skincare. 7-piece set skincare products are a lost cause on me. - It has a light texture and spreads over the skin easily. - My skin is noticeably smoother and softer after only a week of using it. - Convenient as I only need to use this instead of a bajillion of products. - It doesn't leave skin feeling sticky. - We went through a cold spell a few weeks back and I find that using this product is not enough to keep my skin moisturised. I slathered the gel on for all it's worth but I still experienced dryness especially on my cheeks. - My freckles are still as they are, no noticeable fading or improvement as of yet. If you have normal to oily skin with no skin concerns regarding pigmentation or freckles, then yes I do recommend it with 2 thumbs up. Yes, I would but not immediately only because I am the type who loves to try out new products. There are so many moisturisers to try out yet so little time. Hehehe.. I rely heavily on reviews to make decisions on whether to buy a product or otherwise so I really hope that this post has helped you somewhat to make yours. Do you like using a 'Jane Of All Trades' kind of skincare product that does everything? Or do you like using different products separately? Do share in the comments section below. See you in the next post. Toodles! 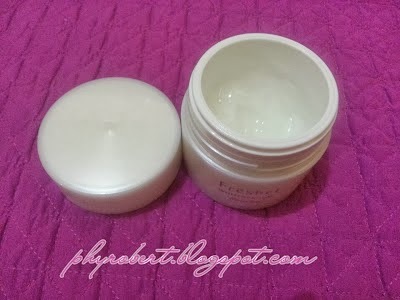 P/S: There were no changes that can be seen from using the Freshel Whitening Gel Cream, only changes that I could feel from touching my own skin. That's why I didn't include a 'Before' and 'After' photo. Hi Jenny, thanks for stopping by. Nope, it's clear. Are you experiencing any irritation on your skin?